How is your sound habitat to day? © 2013 Ricardo Huisman. All rights reserved. 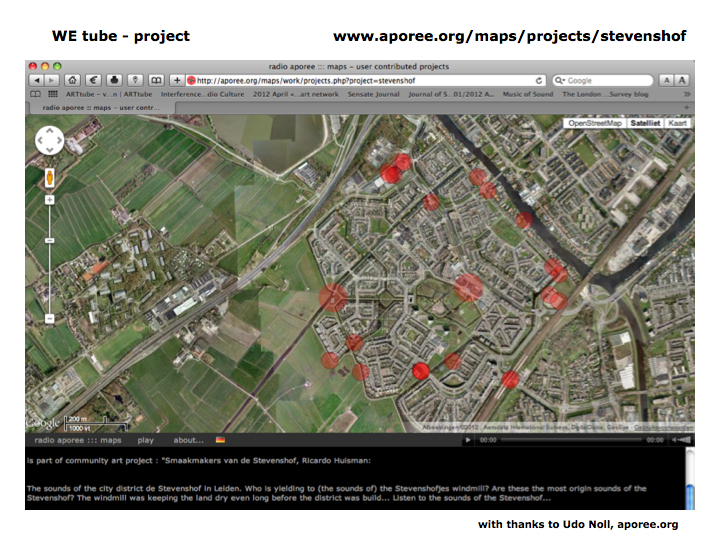 Summer 2011 I finished a community sound art project: “WE tube” with “Sounds of the Stevenshof” in an urban district of Leiden in Holland. 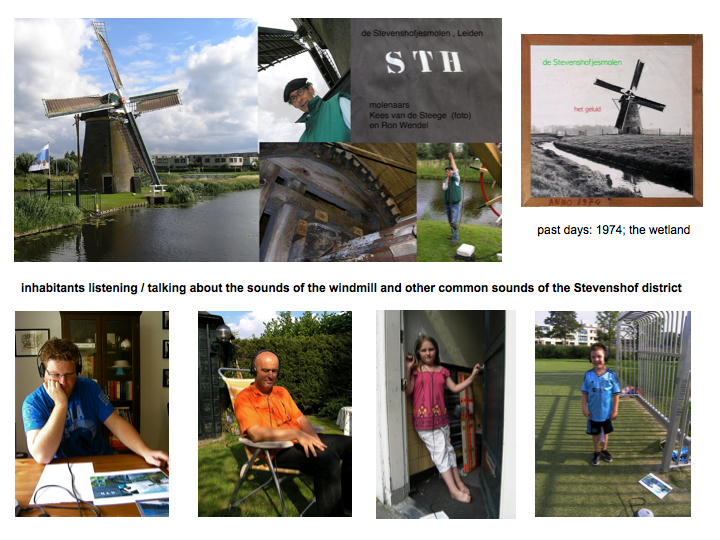 I’ve created a special soundmap with sounds of the district; started with binaural soundscape recordings of the Stevenshofjesmolen (the windmill) as one of the most original sounds of the district and as part of the collective sonic heritage of the Stevenshof as former polder. With the recordings and and headphone I went into the district, ringing doorbells or just asking people in the public spaces to listen to the the soundscape recordings, followed by interviews: reactions and stories of several inhabitants about the windmill, and about the more common sounds of the Stevenshof. Asking young and old how they listen to their environment, their own sound habitat. 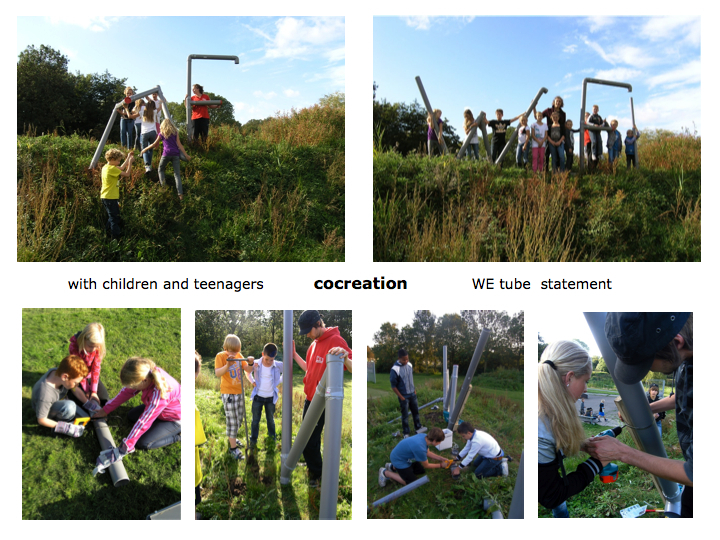 In the second part: the “WE tube” project I have created together with kids and youngsters of the Stevenshof district a big WE tube standing on a little hill in the middle of the park located in the centre of the Stevenshof district as a WE tube statement. It was the start of a four days “tactile sonic intervention”. The big WE was connected to a simple sound box producing several soundscape compositions of the sounds of the Stevenshof mixed with the stories and reactions of the inhabitants, interrupted with switching and searching radio broadcast sounds. 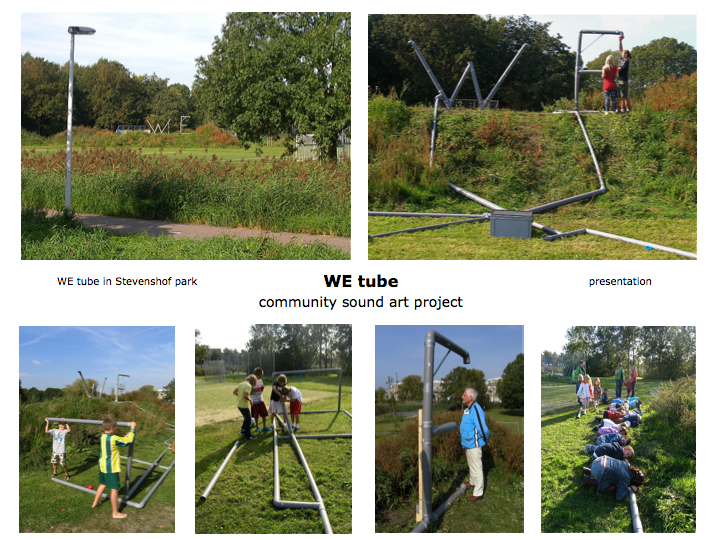 The public in the park, young and old, created their own listening / sound tube connections with lots of pvc-tube material of different length and diameter, bows, tape, saws, etc. : building with tubes, replacing the sounds, (the spatialisation of the sounds), changing the sound colours, adding and mixing their own sounds with their voices or mp3 players, creating new listening positions, feeling the vibrations of sounds and voices through the tubes, having conversations about art, the common sounds and the (sound) history of the Stevenshof, the fundamentals of sound waves or just experiencing a new way of listening by taking a refreshing sound shower under the big E. The result was a continues changing spatial sound scape sculpture intervention with sounds and stories of the Stevenshof in the park. WE are building together…. sound tubes, Kids putting their mp3 players in the sound tube and creating a mix with the sounds of the Stevenshof.. Taking a “sound shower” with the sounds of the Stevenshofjes windmill is triggering memories and stories about past times before the district was build and the place was still an open windy and wet farm land. A school class laying their ears on the tubes to listen and to feel the resonance’s of the sounds and voices…. Licentie Samenvatting: You may read the original content in the context in which it is published (at this web address). No other copying or use is permitted without written agreement from the author. ©2017 Ricardo Huisman. All rights reserved. by Ricardo Huisman. Built with the AutoFocus II Pro Theme.